These days it seems that I’m spending more time at my computer than ever, working with my Online Consulting clients all over the world and writing up blog posts for you! This means that while I love to be able to drink wine coffee while I work, I’m ALWAYS happy to get out of the house and talk to live people (rather than Doug…the dog). My clients, Lisa and Brian Birnie, were the dream team. They knew what they liked, what they didn’t like, and were totally open to new ideas. Creating their home was all about blending their personal tastes with my knowledge, to come up with a design plan that suited them to a tee. Working with Alair Homes and my new bff, Dan (who is like the Rainman of home building and renovation) this home exceeded all expectations in quality and appearance and I know the homeowners were thrilled with the final product – it even got it’s own magazine feature! I may have had to buy Dan’s love via Starbucks coffee, but hey, I’ve done way worse things for love (wink wink). 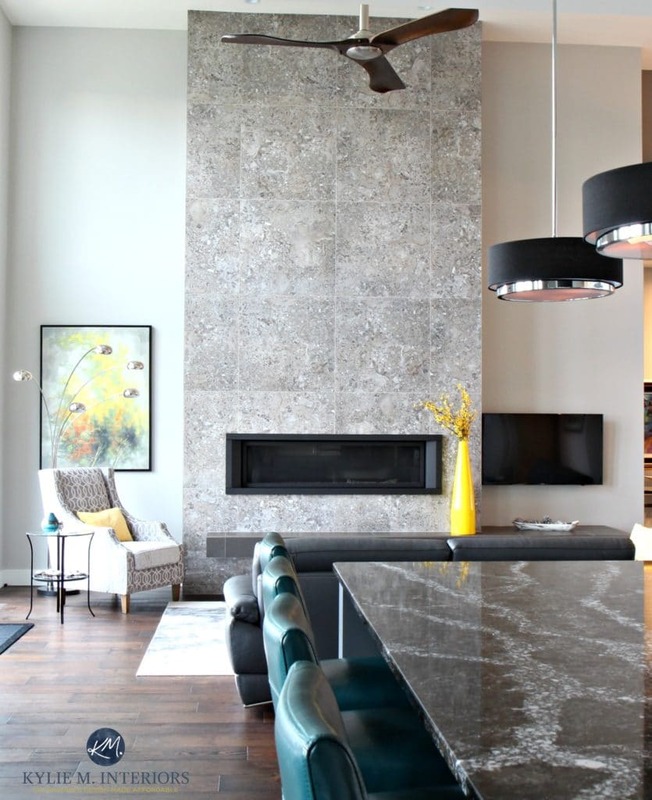 Using Hardi Board in Cobblestone, we created a layered palette of black, brown and greige, with stone for texture. Lisa and Brian had a vision of an entryway/dining room that was separated by beams. 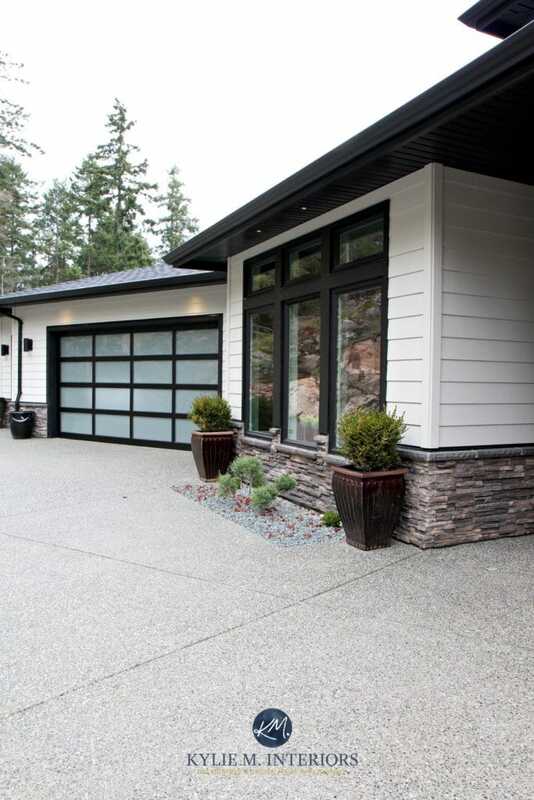 And while the whole ‘cedar beam’ thing is on trend, they wanted something a bit more timeless and contemporary, so we kept it simple with drywall and paint colour – and let the architecture speak for itself. The dining room is a nice step off of the entryway. 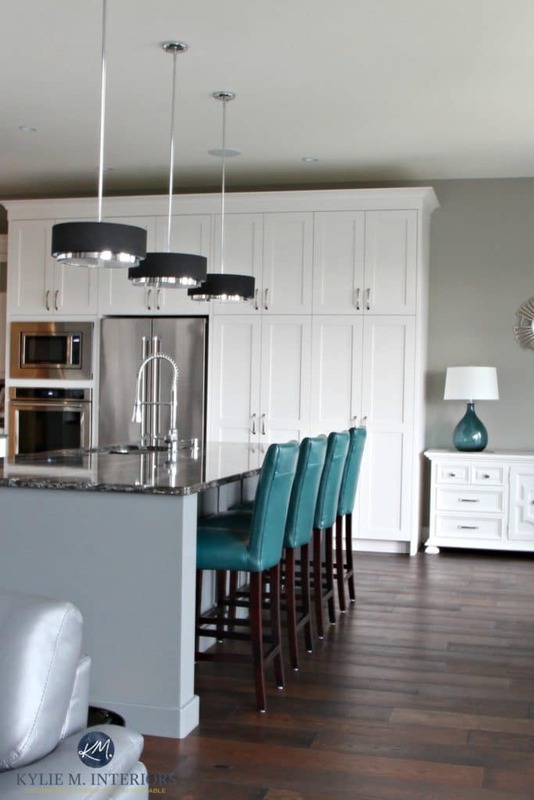 The entire open layout palette consists of layered grays from the Sherwin Williams palette (see the end of the blog post for a paint colour list). With photography by their talented daughter, Jessie Robertson, the dining room makes a statement all of it’s own. I love the layout of this home. Just enough definition to create well-defined function from space to space, but open enough to feel bright, spacious and visually connected. We can thank Austin of Datum Point Studios for the fabulous home plan/architecture. I love the way the island countertop rolls right into the view of the striking, vaulted fireplace. With a nice peek-a-boo view into the dining room. Lisa’s LOVE of teal came through in the furnishings and accessories! 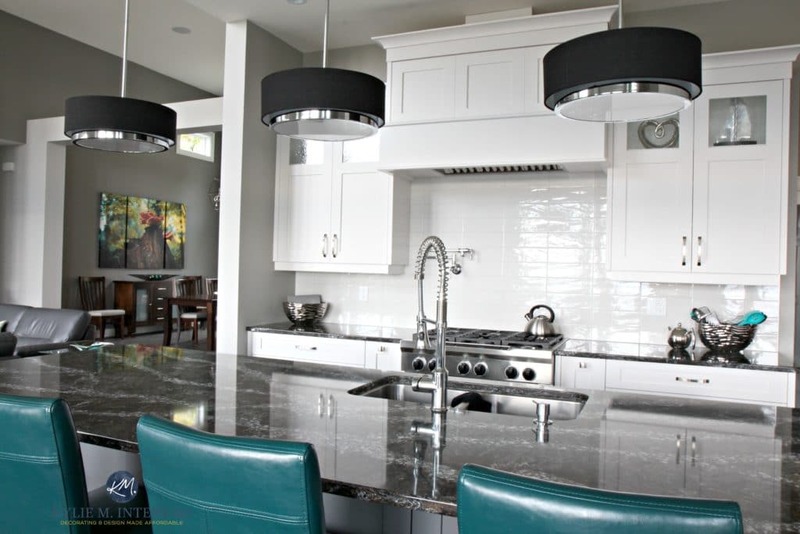 The kitchen countertop and island are topped with Cambria Ellesmere, a striking black, brown, gray and white blend quartz countertop. Early on, we decided to open up the stairwell so that as you were walking down, you’d be able to see down into the wine room/family room – it was an expensive, but smart choice! Opening up the wall made for a graphic detail, which is WAY more fun to look at than plain old drywall! 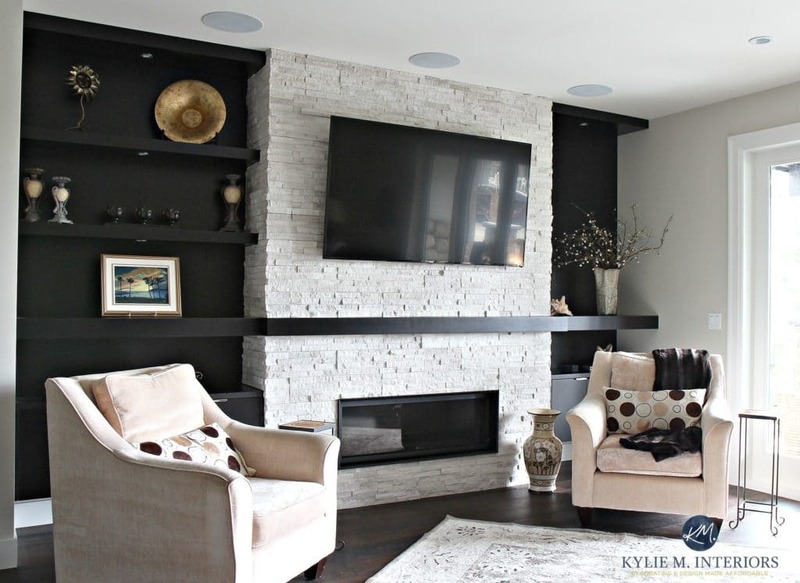 The stacked stone fireplace is a nice balance to the dark espresso built-in cabinets and floating shelves – created by Krystalyne at Mid Island Cabinets (official creative genius). With it’s ocean view, the master bedroom is a restful retreat, equipped with a walk-in closet, laundry room and a beautiful ensuite bathroom. The master bedroom palette is a range of soft, warm gray neutrals that flow seamlessly into the ensuite bathroom. The bathroom palette consisted of Benjamin Moore Balboa Mist on the walls, hexagon marble accent tile and porcelain that looks like marble (a great way to save money AND maintenance). 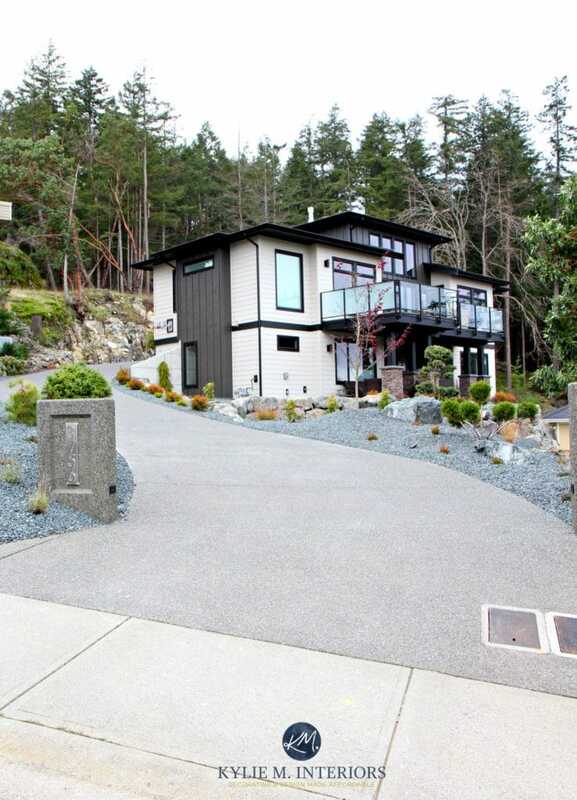 This home boasts 3 other bathrooms – 1 for each guest room and a powder room upstairs. Just look at that freakin’ countertop – so gorgeous! It’s Cambria Galloway, a beautiful blend of neutral colours, glitz and an earth toned green. 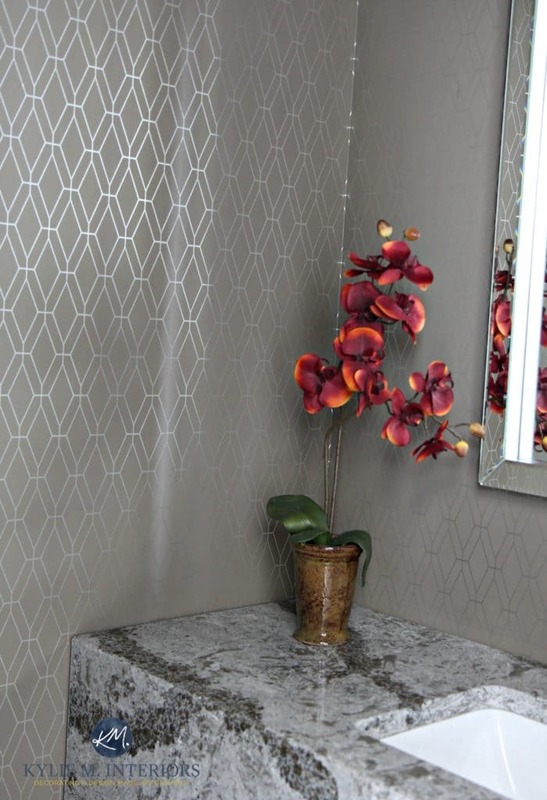 We just fell in love with the mosaic tile with the mother o’ pearl accents. Again, Cambria Galloway looks STUNNING with the graphic wallpaper. Looks awesome! Random questions: where were the bar chairs found and also do you know what company did the big canvasses? Hi Briana! The homeowner got those at Pier 1. The large canvases were done by a company out of Ladysmith called Canvas Plus http://www.canvasplus.ca/ and it was ‘reasonably’ affordable! Kylie, you did an awesome job!!! Breathtaking!!! so color coordinated, you nailed my taste. Random question, Where was the rug purchased? or where can I find similar? Hi Michelle, thank you! You know, I think she scored on that and found it at Home Sense! Hooool-y cow, Kylie! This house is ahhhh-mazing!! Have been loving your website for a while…. simply beautiful! Thanks Mary! It is pretty cool. They had an open house for all of the trades/builder/landscaper/etc… and it was just so fun to see it all put together. I wish I were a professional photographer so that I could really do it justice! OMG this is sooo amazing, a dream come true!! The detail, the beautiful color – how it all comes together soooo well. I could just walk from room to room, …forever, and never need to go outside, … well except to look at the exterior of the house!! What an extraordinary creation!! Well done!! Thank you Lorna! It did turn out so lovely and the owners are just the coolest people too – I’m lucky to do what I do! Beautiful home ! Beautiful decor that all works brilliantly together. I guess I need to get me some cleaning pants! Woot-woot! Everything looks very polished, but the powder room is definitely my favorite. Looks amazing! So much to look at. Quick question, what is the color of the island? Thanks!